According to a report from Bloomberg New Energy Finance (BNEF), wind and solar power may comprise 50 percent of global electricity generation by 2050. 65 researchers from BNEF assembled data on the evolving cost of clean energy technologies across the globe and put together the 150-page New Energy Outlook (NEO) 2018 report. The researchers predict that declining technology costs, especially in battery storage, will allow for an increase in investment in wind and solar power in the future. BNEF expects that, in the future, the global electric system will be dominated by decreasing lithium-ion battery prices. Lithium-ion battery prices have decreased by 80% per MWh since 2010, and prices are projected to continue to decline as electric vehicle manufacturing increases in the future. 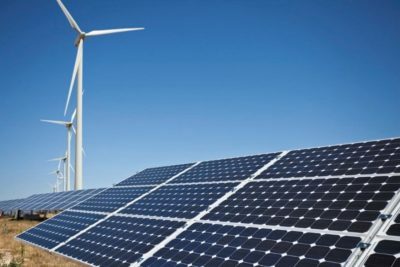 In the report, BNEF predicts that $548 billion will be invested in battery capacity by 2050, and that this investment in battery capacity will be matched by a $8.4 trillion investment in wind and solar by then. The researchers predict that this massive investment will lead to significant growth in renewable energy generation in major markets: wind and solar energy are expected to comprise 87%, 62%, and over 50% in Europe, China, and the United States respectively. With this significant growth in cheap renewable energy, expensive coal-fired power is expected to be pushed out: it could fall from 38% of global generation to 11% by mid-century.